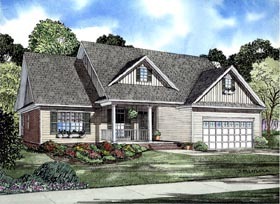 The mixed materials specified on this craftsman style home create an attractive exterior. The great room, complete with fireplace, is the central entertaining area of your home. In your spacious breakfast room with accommodating computer center you will be able to manage your budget effectively. The rear grilling porch will serve as the entertaining area for summer barbeques. The split bedrooms design will be appreciated when retiring for the evening to the master bath. The upper bonus area will be an excellent choice for the home theater for the entire family?s enjoyment.